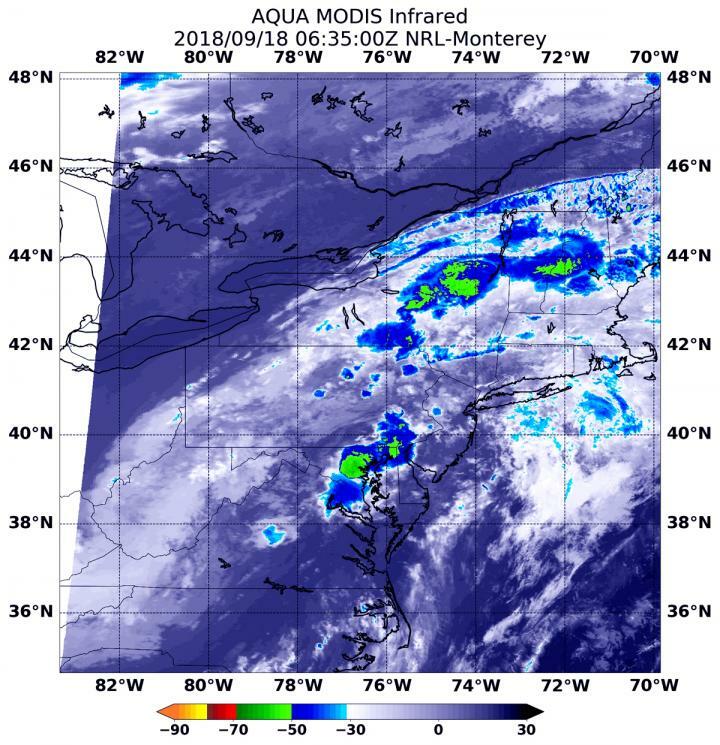 NASA's Aqua satellite provided an infrared look at fading Post-Tropical Cyclone Florence's clouds, revealing where the strongest thunderstorms were located. Those strong thunderstorms stretched from the Mid-Atlantic to New England. On Sept. 18, Florence is becoming an increasingly elongated low pressure area while it generates heavy rain over parts of the Mid-Atlantic and into southern New England today. Flash flood watches are in effect for portions of the Mid-Atlantic States and southern New England. At 2:35 a.m. EDT (0635) on Sept. 18, the Moderate Resolution Imaging Spectroradiometer or MODIS instrument aboard NASA's Aqua satellite analyzed Post-Tropical Cyclone Florence in infrared light. MODIS found several areas of coldest cloud top temperatures and strongest storms located over several U.S. states: Maryland, Delaware, northeastern upstate New York, central Vermont and New Hampshire. Those cloud top temperatures were as cold as or colder than minus 63 degrees Fahrenheit (minus 53 degrees Celsius). NASA research has found that cloud top temperatures as cold as or colder than the 63F/53C threshold have the capability to generate heavy rainfall. The National Weather Service's Weather Prediction Center (WPC) in College Park, Md. issued the final advisory on Florence at 11 a.m. EDT. At 11 a.m. EDT on Sept. 18 Florence's center of circulation was just 45 miles west-northwest of Boston, Mass. near latitude 42.6 degrees north and longitude 71.9 degrees west. The post-tropical cyclone is moving toward the east-northeast near 30 mph (41 kph) and this motion is expected to increase as the low moves east into the western Atlantic later today. Maximum sustained winds are near 25 mph (35 kph) with higher gusts. The low will transition into a trough or elongated area of low pressure, off the East Coast tomorrow.